ATV riding demands that your youngster wear proper protective gear. ATV riders should ALWAYS wear a helmet, eye protection, gloves, long pants, a long-sleeved shirt or jacket, and over-the-ankle boots. Anything less is not adequate protection. NEVER let anyone ride an ATV without a Department of Transportation (DOT) compliant motorcycle helmet. Be sure it fits correctly. It should be snug but not tight. It must be properly fastened. Protective gear is necessary in any weather, even when the temperature is warm. In cold weather you should dress your youngster with additional layers of clothing. Some riders wear a kidney belt and chest or back protector for additional protection. Adjacent is a drawing of well-equipped riders. Show this drawing to your youngster and point out what is important. 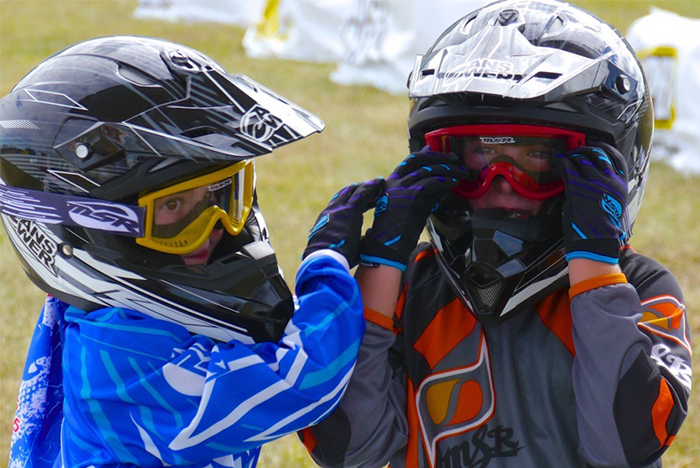 Have your youngster wear safety gear whenever getting on an ATV. This action will stress the importance of safety gear and help to develop safe riding habits. To properly mount the ATV, first check that the parking brake is set. Mounting is from the side, putting the left foot on the footrest (if mounting from the left). Be careful not to step on the shift ever (if the vehicle is equipped with one). The other leg is swung over the seat and placed on the other footrest. Care should be taken to rest the feet in the middle of the footrests. This allows correct use of the shift lever and the rear brake. Once mounted, the youngster should assume the correct riding posture. Dismounting reverses the mounting procedure. With the parking brake set, the leg is swung over the seat onto the ground. The other foot is then removed from the footrest. Correct riding posture helps your youngster operate the controls. Head and eyes up, looking well ahead. Elbows bent, slightly out and away from the body. Feet on the footrests, toes pointing straight ahead.